Onsite transformer oil reclamtion includes fuller’s earth processing or silica gel regenerating, filtering treatment, heating process and dehydration/degasification processing. It is possible to restore oil to new oil specifications with a combination of these treatments. Any transformer oil can be brought back to new oil specifications, although some contamination levels may make it more economically viable to replace the oil. A regular maintenance program allows the transformer oil to be upgraded before sludge created by oxidization occurs. This results in a cost saving to the transformer owner. Once sludge occurs, the internal parts of the transformer require flushing with hot oil to remove the sediment. If not rinsed down, the core and coil assembly will hold the acids which will leach back into the oil over time. This will cause the re-deterioration of the oil to be accelerated. If reclamation is done in the early stages of the acid build up (approx. 0.1) before sludging occurs, the oil will retain its properties longer under normal operating conditions. Reclamation of oil with a high acid content consists of fuller’s earth treatment, silica gel treatment, filtering treatment and degasification. Fuller’s earth treatment an silica gel treatment will remove both acid in the oil. 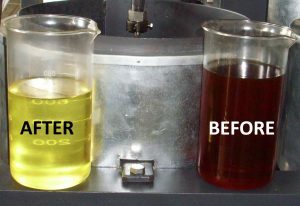 This process corrects the acid number as well as the colour. Filtering system will remove the particulates completely. Degasification removes gasses and water. Transformer oil will hold water in suspension. The amount of water it will hold depends on the temperature of the oil. For example, if the oil temperature is 20C the maximum amount of water that can stay in suspension is approx. 53 ppm. It is likely that if oil is at its saturation point there will be free water at the bottom of the transformer. The ASTM limit for water is 30 ppm but the temperature must be considered. Due to the decreased dielectric strength with high water content it is important to complete a degasification on the oil. If the oil is especially high in water a hot oil dry out should be considered. Although it is more costly than just a degasification, it also removes any water that may be in the core and coil assembly.This is completed by circulating the oil through the degasification process and the transformer to heat the transformer. Then if the transformer is capable of vacuum the oil will be removed and will be held under vacuum for a determined number of hours. The oil is then degasified back in to the transformer. If the decision has been made to replace the oil, either reclaimed or new oil can be used as retrofill material. If the tank is capable of a vacuum, the transformer should be filled under vacuum, based on manufacturer’s recommendations. If the transformer cannot withstand a vacuum, the oil should be degasified into the transformer and circulated through the degasifier three times the volume of the transformer to help remove any moisture present in the insulation. New oil often requires further degasification to remove air and moisture added during transportation and handling procedures. This further degasification will increase the life expectancy of the oil in the transformer. Mineral insulating oil is a valuable resource that can be recycled many times and returned to its original condition. The benefits of a regular maintenance program for your transformer include both economical and environmental factors. A failure of a transformer can result in significant environmental clean up costs. In conclusion, a good preventative maintenance program for your transformers is money well spent. You will have peace of mind that comes from knowing that you have done due diligence in maintaining the continuing operation of your transformers. REXON Transformer oil recycling system will help you solve transformer oil problems, reclaim old transformer oil to be new save oil replacement cost, and maintain transformer oil is always in standard index as new oil. Welcome to contact us for more information.